Katharine Holmes is currently developing new work following recent exhibitions including her very successful exhibition at the Mercer Gallery, Harrogate. This was created as part of the Arts Council England funded Mercer Gallery project Art and Landscape which followed the work of individual women artists who have been inspired by the Yorkshire landscape. 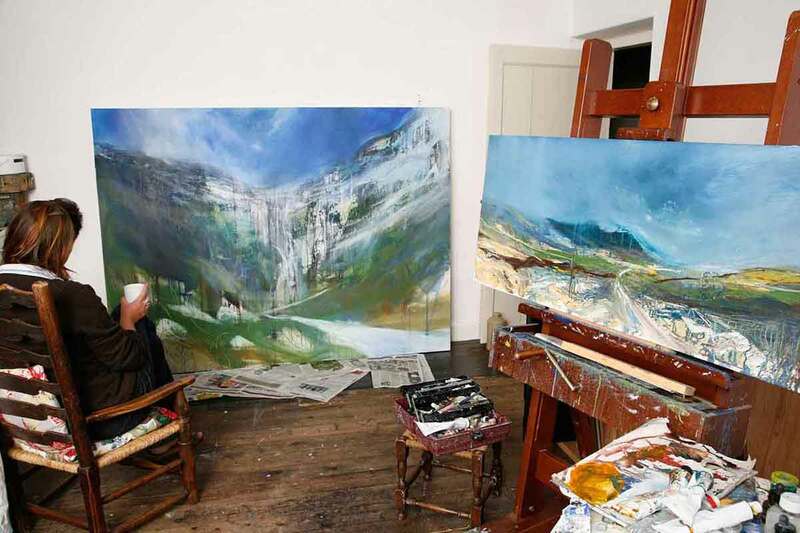 Katharine is an artist who has become known for her paintings which capture the Northern Landscape, predominantly her native Yorkshire Dales. Born into a Malhamdale family of painters in 1962 and following degree study in Fine Art at the University of Newcastle upon Tyne Katharine returned to the Yorkshire Dales in 1990. Her work has been exhibited nationally and internationally and her paintings are in many private and corporate collections including that of Leeds University where she held her first major solo exhibition in 1999. In June 2009 she returned to the Stanley and Audrey Burton Gallery, Leeds University to show new paintings and an installation of drawings as part of a large retrospective exhibition "A Malham Family of Painters". "It is not so much that Katharine Holmes makes statements about her native landscape as that she is constantly questioning and trying to dicover its essence. Then she tries to fuse her materials to her subject matter, by means of emotional understanding, and they become one".